Once a royal homestead, situated on twenty three picturesque hectares amongst olive orchards and vineyards, Cascade Country Manor is an idyllic and luxurious private retreat. Once a royal homestead, situated on twenty three picturesque hectares amongst olive orchards and vineyards, Cascade Country Manor is an idyllic and luxurious private retreat. A small stream meanders through the estate and cascades down a little waterfall. The Manor House has five double rooms, three suites and one family room. 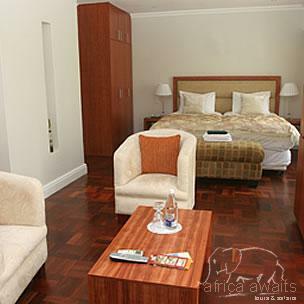 Each room is air-conditioned and has an en-suite bathroom. Television, Mini Bar Fridge and Telephone are just some of the amenities you will find in your Classic Rooms and Suite. 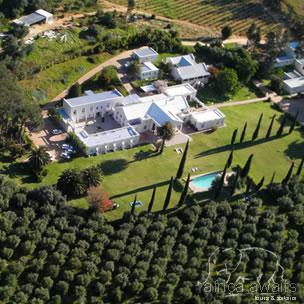 At this Mediterranean-style villa in the heart of the scenic Cape Winelands, you will experience warm hospitality. Your hosts at this family-run, country guesthouse are Maika and Volker Goetze, noted for their professional and accommodating attitude to guests’ needs. One of the treasures inherited by the Duke of Bedford, who called the estate home in the earlier parts of this century, is an Olive Grove. From these decade old trees comes the harvest for Cascade Manor’s own Olive Oil. It is a unique blend produced mainly from Frontoio and Leccino Olives. You can experience a pre dinner Olive Oil Tasting enjoyed with freshly baked bread from the wood fired stone oven. Volker is a creative chef and showcases fresh local produce in preparing his sought after dinners at the guesthouse (by prior arrangement only). If you visit for three nights or longer, your stay at Cascade Country Manor includes a complimentary two-course dinner on the first night. Should you want to dine at one of several award-winning restaurants nearby, a chauffer will gladly take you there and bring you back afterwards. Cascade Country Manor offers function venues indoors and out. Cascade Country Manor is situated 40 minutes from Cape Town International Airport and 5 minutes from Paarl, at the head of the secluded Waterval Road. Nearby attractions include Boschenmeer Golf Estate and Peal Valley Golf Estate and the Nederburg Wine Estate. The lovely Boland is around the corner, Stellenbosch and Franschhoek are just a skip and a jump away, and South Africa’s “mother city”, the incomparable Cape Town, is a 45 minute drive along the N1 motorway. 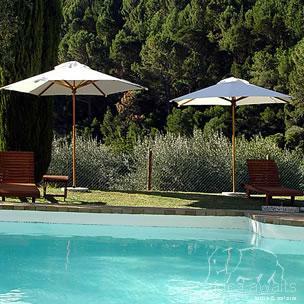 With your holiday, safari or business trip from in to Cascade Country Manor in Cape Winelands.